Whenever we go out to eat at a Mexican restaurant I ALWAYS get rice and beans on the side. 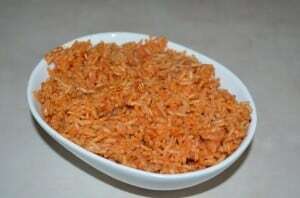 Most of the time I hardly touch the beans but I devour the rice! It seriously is the best rice ever! I have tried to no end to try to recreate it at home and every time I always end up disappointed. Then I found this recipe on Favorite Family Recipes and I was so happy I did. It tastes just like the stuff made in the restaurants! Over medium heat heat oil. 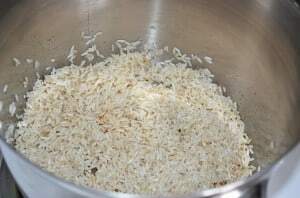 Add rice and stir gently until rice is light brown (about 2 minutes). 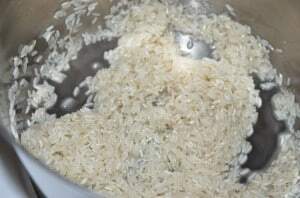 Add minced garlic, salt and cumin and continue to stir until rice is golden brown. Add tomato sauce, chicken broth and cilantro. Turn heat to medium-high and bring to a boil. Turn heat to low and allow to simmer. Cover and allow to cook 20-25 minutes. Thanks! Me too…they mix so well together!